As the festive season has started, people are researching eco-friendly ideas to decorate their house. Creating an indoor garden can be a unique and environment-friendly way to beautify your living space. But if you worry about not having enough space, then you can opt for an indoor vertical garden. Nowadays, it's very easy to create your own vertical garden with the presence of new garden concepts like modular planting systems and hanging planters, feels expert Harpreet Ahluwalia, owner of Earthly Creations and Anjali Jain, owner of Kala Drishti. They also shared some useful tips to celebrate the festivals with indoor vertical garden. Frame a vertical garden: It's a Do It Yourself (DIY) project that can be tried at home without any complication. You need a flat box, a wooden frame, a small amount of soil, a metal mesh and a small bud of succulent. Make a photo frame like structure with the flat box and the wooden frame. Add soil into it and cover it with the metal mesh. The box and the mesh hold the soil in place. Now poke the stems of the succulent bud through the mesh into the soil. Leave the frame lying flat in a cool, bright place till the stems take root. Your beautiful vertical garden is ready. Recycle plastic bottles: It is another DIY project where the used plastic bottles are recycled into pots as creative and fun vertical garden. You need 2-3 plastic bottles, soil, seedlings, string, cardboard, and a needle. For the opening, cut a rectangle in the middle of the bottle. Poke small holes with the help of a needle on the opposite side of the bottle. Line the inner sides of your bottle with cardboard, leaving the holes open. Now add the soil, put the seedlings and water it. Determine the length of the vertical garden and accordingly cut the strings and tie it to the bottle. Hang it at the desired place. 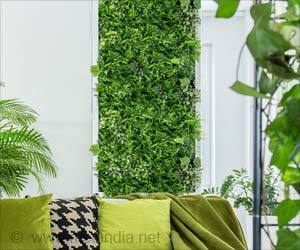 Hanging vertical garden: This vertical suspended garden will give your home a new freshness and decoration which is required around this festive season. To hang the pots, you can choose macrame pendants, this is a trending fashion for suspended gardens and looks very decorative. To alternate this method, you can also go for small wooden shelves where you can place the pots, and holding them with a thick cord of the sailor type will give a beautiful effect in your living space. You can use this method to harvest your own fresh herbs right in your kitchen. Magnet the plants: This is a very sweet and a simple way to add some bloom to your walls. All you need are some container, preferably of the same shape, paint, washi tape, soil, a small flower plant, and a magnet. Take the empty containers and paint them with bright colors and decorate it with washi tapes. Fix 3-4 magnets behind the container with the help of hot glue. You can now easily hang these small pots on any magnetic surface and add a splash of colors to your house. These structures enable space management and also decorate the interiors of houses. You can discover your own unique way to make a vertical garden right inside your home. Research shows that gardening connects you to the nature and children too can reap the benefits of digging, raking and weeding.